BSE Sensex closed higher by 294.71 points, or 0.87%, to 34,300.47, while the Nifty 50 rose 84.80 points, or 0.81%, to close at 10,539.75. 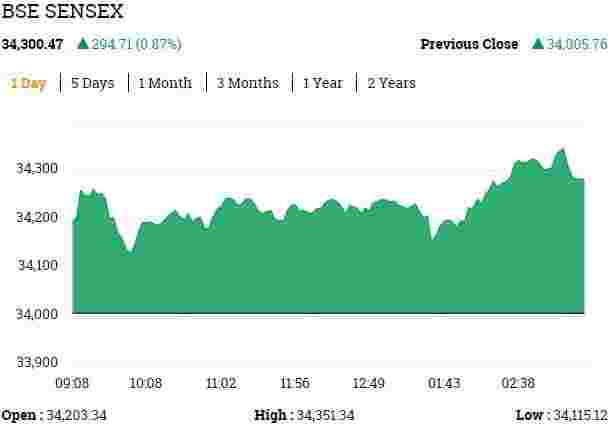 BSE Sensex traded higher by 322.79 points, or 0.95%, to 34,328.55, while the Nifty 50 rose 97.05 points, or 0.93%, to 10,552. Finolex Cables Ltd shares rose 3.08% to Rs690.80 after the company said its December 2017 quarter net profit rose Rs74.87 crore from Rs68.44 crore a year ago. Shares of Shipping Corp. of India Ltd gained as much as 9.10% to Rs84.55 in anticipation of good results and the board meeting was rescheduled to 13 February 2017. The Indian rupee strengthened against the US dollar on Monday, tracking gains in Asian currencies. The home currency was trading at 64.31 a dollar, up 0.13% from its Friday’s close of 64.40. The rupee opened at 64.26 a dollar and touched a high and a low of 64.24 and 64.32, respectively. The 10-year bond yield was trading at 7.497%, compared to its previous close of 7.49%. Zuari Agro Chemicals Ltd shares rose 8.69% to Rs536.15 after the company posted a 32% jump in its standalone net profit to Rs48.02 crore in third quarter of the current fiscal. Indian Bank Ltd on Monday said its December-quarter net profit fell 18.85% on the back of higher provisions and lower other income. The bank has posted a net profit Rs303.06 crore for the three months ended 31 December from Rs373.48 crore in the same quarter last year. Shares rose 6.09% to Rs360. Sharda Motor Industries Ltd shares surged as much as 7.5% to Rs2,560 after the company reported a net profit of Rs17.15 crore in the December 2017 quarter, up from Rs11.83 crore a year ago. Reliance Infrastructure Ltd gained as much as 4.56% to Rs311.60 per share after it received Letter of Approval from NTPC for Flue Gas Desulphurisation work for its power plant in Jhajjar, Haryana for the order value of project is Rs 567 crore. BSE Sensex traded higher by 220.67 points, or 0.65%, to 34,226.43, while the Nifty 50 rose 60.80 points, or 0.58%, to 10,515.75. BSE MidCap and BSE SmallCap were up 1.41% and 1.75%, respectively. All the sectoral indices on BSE except IT and teck traded higher led by healthcare, industrial, capital goods and realty. Larsen and Toubro Ltd shares gained 1.93% to Rs1,353.15 after its unit L&T Hydrocarbon Engineering has signed a major field development EPC contract with Al Dhafra Petroleum Operations Co. Ltd, Abu Dhabi, UAE, with a value in excess of Rs2,200 crore. Shares of Oil India rose 2.71% to Rs366 on BSE after net profit surged 55.1% to Rs705.22 crore on 13.52% rise in total income to Rs3,065.30 crore in Q3 December 2017. Marico Ltd shares gained as much as 4.56% to Rs311.60 per share after the company reported a 16.51% increase in its consolidated net profit at Rs223.28 crore for the quarter ended December 2017 on account of higher income led by market share gains. Steel Strips Wheels Ltd gained as much as 6.56% to Rs1,114.90 per share after it bagged an order of Caravan Wheels from Europe. Shares of Kitex Garments dropped as much as 10.82% to Rs258.85, the most in six months, after its net profit declined 45% to Rs17.62 crore for the quarter ended December 2017 against Rs31.80 crore for the same quarter last year. A combine of ArcelorMittal and Nippon Steel, Tata Steel and NuMetal Mauritius, a consortium of Russia’s VTB Capital and the Ruia family, are likely to submit binding bids for debt-laden Essar Steel. Cadila Healthcare gained as much as 5.35% to Rs433.05 per share after it completed FDA inspection at Moraiya facility and no observation was issued as it said on Friday on the exchange. 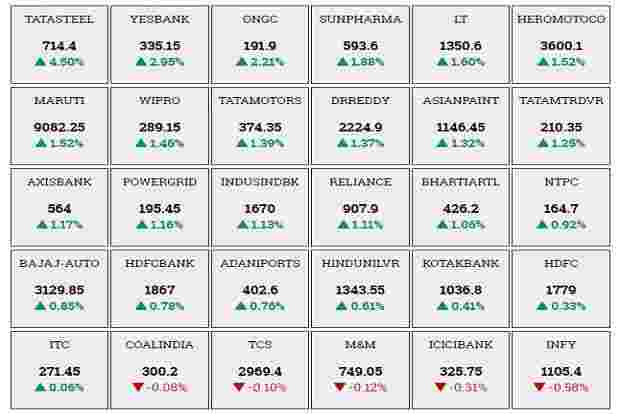 BSE Sensex traded higher by 212.41 points, or 0.62%, to 34,218.17, while the Nifty 50 rose 59.75 points, or 0.57%, to 10,514.70. Meanwhile, the MidCap was up 1.23% and SmallCap rose 1.57%. Shares of Fortis Healthcare lost as much as 3.14% to Rs143.65 per share after the promoters Malvinder and Shivinder Singh stepped down from the company’s board, allegations of financial misappropriation surfaced against the brothers. According to Bloomberg, the brothers took at least Rs500 crore out of the publicly traded hospital company they controlled without board approval about a year ago. Tata Steel shares gained as much as 5.02% to Rs718 per share after its net grew close to five folds to Rs1,135.92 crore for the quarter ended December 2017 from Rs231.90 for the same quarter last year. Amara Raja Batteries Ltd gained as much as 7.6% to Rs859.70 per share after it reported 20% rise in its net profit to Rs134.45 crore and 3.57% rise in its net sales to Rs1,553.46 crore. State Bank of India shares fell 2.88% to Rs287.85. The company reported a net loss of Rs2,416 crore for the fiscal third quarter after setting aside funds to cover rising bad loans and losses on its bond portfolio. It had reported a net profit of Rs1,582 crore in the September quarter. Oil and Natural Gas Corp. Ltd shares rose 3.09% to Rs193.55. A consortium of Indian companies led by ONGC Videsh Ltd has bought a 10% stake in the UAE’s offshore oil and gas field Zakum. Bank of Baroda shares gained 5.66% to Rs165.20. The company reported that its net NPAs or bad loans fell to 4.97% of the net advances by the end of third quarter for this fiscal from 5.43% in year ago period. The company, however, registered a decline of 56% in its net profit at Rs112 crore for the third quarter ended December. CG Power and Industrial Solutions Ltd said its unit CG Power Systems Indonesia has bagged an order from Indonesian state utility PT PLN (Persero) for manufacturing and supply of 64 units of power transformers valued at $55 million. Shares rise 2.71% to Rs90.85. The Indian rupee strengthened against the US dollar, tracking gains in Asian currencies. At 9.09am, the home currency was trading at 64.26 a dollar, up 0.21% from its Friday’s close of 64.40. The rupee opened at 64.26 a dollar and touched a high and a low of 64.24 and 64.29, respectively. The 10-year bond yield was trading at 7.46% compared to its previous close of 7.49%. BSE Sensex traded higher by 245.36 points, or 0.72%, to 34,251.12, while the Nifty 50 rose 79.10 points, or 0.76%, to 10,534.05.